Circe was one of the most powerful enchantresses of Greek mythology, who some call a witch and some a goddess. Today, Circe is famous as a host of Odysseus and his crew as they sought to return home to Ithaca after the Trojan War. ​Circe was a daughter of the Greek sun god Helios, and his wife, the Oceanid Perse (Perseis). This parentage made Circe sister to another powerful sorceress, Pasiphae, wife of Midas, as well as Perses and Aeetes, famous kings of Greek mythology. Whilst, Perses and Aeetes were not known for their magical abilities, a niece of Circe, Medea certainly was. ​Of the three female sorceresses, Circe, Pasiphae and Medea, Circe was regarded as the most powerful of the three, and able to concoct powerful potions, but Circe was also said to have power to hide the sun and moon as she willed. ​Circe was also known to call upon the assistance of “dark” deities, in the form of Chaos, Nyx and Hecate. ​The home of Circe was said to have been upon the island of Aeaea, for Circe had been brought to the island by her father, Helios, upon the god’s golden chariot. Aeaea though does not appear on any modern map, and in antiquity there was great debate about where Aeaea was to be found. Locations were given for the island of Aeaea to be found both east and west of Italy, and Apollonius of Rhodes tells of it being south of Elba, but within sight of the Tyrrhenian coastline. Circe remained an important mythological figure through until the Roman period, where writers told of Aeaea actually being the island of Ponza, or else Mount Circeo (Mount Circaeum), the latter being a mountain surrounded by marshland and sea, rather than being a true island. ​Circe would live within a stone mansion upon Aeaea, a mansion located in a forest clearing. 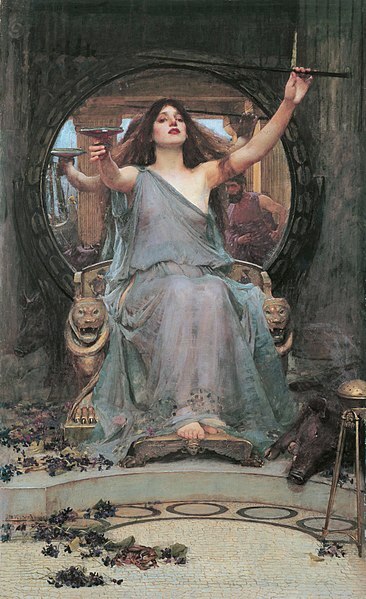 Circe would have her own throne, and was attended to by various nymphs, who also gave flowers and herbs used in Circe’s potions. 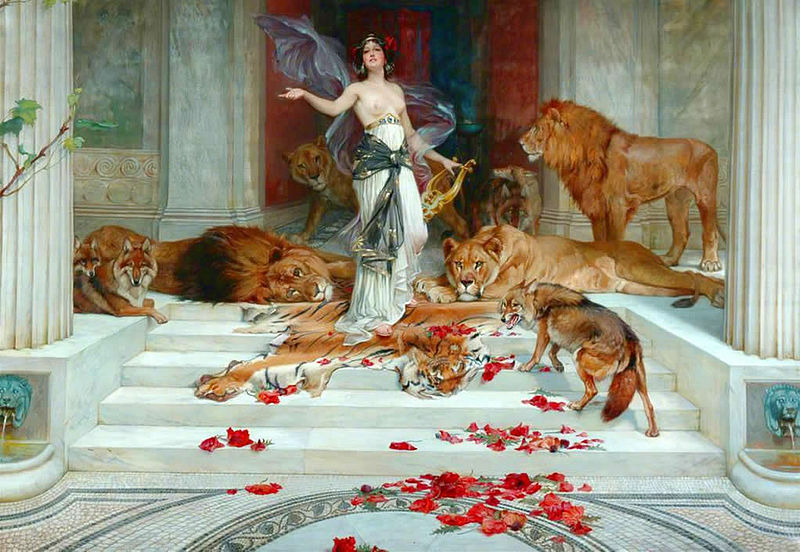 Circe also had her own menagerie of animals, lions, bears and wolves, who though wild beast behaved as if they were domesticated animals. 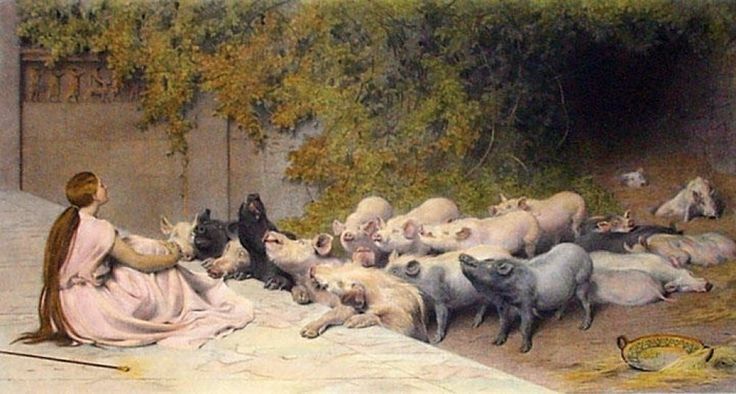 Some tell of these animals having been tamed by Circe, but others tell of them being men who had been transformed into animals by the sorceress. The theme of transformation was one which appeared in most surviving tales of Circe. It was said that Circe was in love with Glaucus, a minor sea deity, but Glaucus knew not of this love, for he only had eyes for Scylla, a beautiful maiden. Some tell of Circe poisoning the water in which Scylla bathed, and some tell of Circe giving Glaucus a love potion, which the sea god believed would ensure Scylla fell in love with; in either case, Circe’s potion transformed Scylla into a hideous monster who later became famous for wrecking ships in conjunction with Charybdis. ​A similar tale of love scorned would be told by Roman writers, when Circe fell in love with Picus, a son of Cronus (Saturn). Circe would seek to seduce Picus, but she was scorned once again, for Picus was in love with Caenns, a daughter of the Roman god Janus. Picus rejected the advances of Circe, and in retribution recited a spell which transformed in Picus into a woodpecker. When friends of Picus came to Circe to seek news of their friend, they being unaware of his transformation, Circe then transformed them into other animals, giving rise to much of the fauna found upon Mount Circaeum. 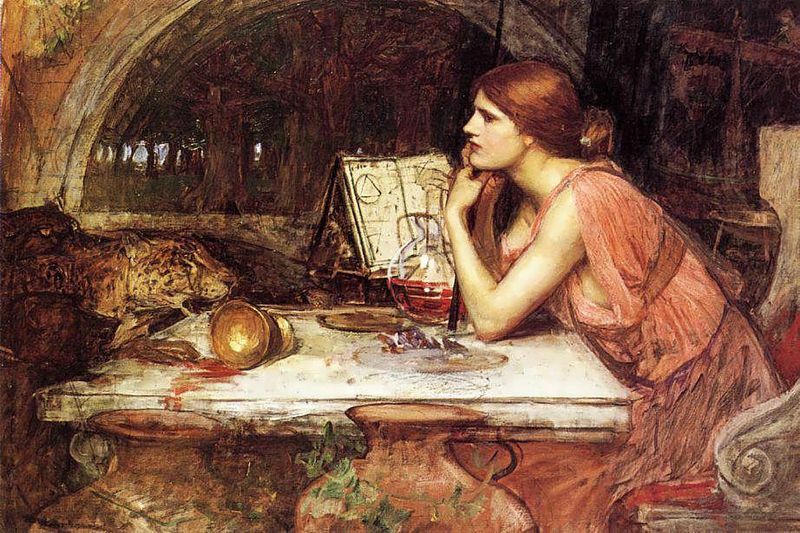 ​Circe is most famous for her encounter with Odysseus, as told by Homer and other writers. Odysseus and his men landed upon Aeaea, not knowing where they were, but hoping that this would be a safe refuge after their troubles with Polyphemus and the Laestrygonians. Quickly though, Odysseus realised that he and his men were in as much trouble as they had previously, for one group of men, who were searching the island, came across Circe’s mansion, and they, bar Eurylochus, are enticed to enter the mansion by Circe herself. These unwary men partake of food given to them by Circe, but as they ate, they became transformed into swine. Circe would have used her magic upon Odysseus as well, but the king of Ithaca was aided by Hermes, with the god giving him advice as well as potion to counteract that of Circe. Subsequently, Circe and Odysseus would become lovers; Circe would thus transform Odysseus back into their previous forms, and for a year Odysseus and his crew lived in a relative paradise. Eventually, it was time for Odysseus to leave Circe, and Circe gladly gives her lover help to enable him to return home. Odysseus has to travel to the Underworld to seek out the deceased Tiresias, who would be able to tell Odysseus all that Circe could not. Circe thus tells Odysseus how he can enter the Underworld and afterwards, Circe also tells Odysseus how he can safely traverse between Scylla and Charybdis. ​In the generation before Odysseus and his men, Circe had also played host to another band of heroes, for Medea led the Argo to the island of Circe, as Jason and his men fled from Colchis. To enable the escape of the Argonauts from the Colchian fleet, Medea had killed her own brother, Apsyrtus, and then thrown his dismembered limbs into the sea, delaying her father Aeetes, who sought to retrieve all of the body parts of his son. For such a crime, Medea and Jason required absolution, and so it was to her aunt hat Medea came, and Circe was thus said to have purified them, allowing them to continue their voyage unmolested. As a lover of Odysseus, Circe was said to have become son to three sons by the King of Ithaca; these sons being Agrius, Latinus and Telegonus. Of these three, Telegonus is the most famous, for as well as being a king of the Etruscans, Telegonus also accidentally killed his father. Subsequently, Telegonus would wed Penelope, and Telemachus, son of Odysseus and Penelope, would wed Circe. Some also call the son of Circe, Latinus, king of Latium, who would welcome Aeneas to his kingdom, though nothing of note is said about Agrius. ​Roman writers would also add three further sons of Circe and Odysseus, Romus, Anteias, and Ardeias, named, in some sources, as the founders of the Italian cities of Rome, Antium and Ardea. Later mythology, particularly in the work of Nonnus, also named Faunus (Phaunos) the rustic god as a son of Circe and Odysseus, but Faunus was more commonly considered to be an equivalent to Pan.